As the Harvey recovery continues for many, new information is still coming in. Debris removal continues to be the focus of Harris County, who is in charge of this. We do not have a schedule for you, but their processes and contractors are working better than at the beginning of the disaster and cleanup progress is being made. If your street, block, or neighborhood has not yet seen cleanup, please have patience. FEMA reported they have over 700,000 claims that have been filed in the Texas Gulf Coast. If all are legitimate, (they are also tasked with trying to prevent fraud at the same time), this is loosely equivalent to having lost ALL of the dwellings within the Houston city limits! It may help, however, to call the Harris County Debris Hotline at 713-274-3880. If you are concerned about floodplain proximity, call the Harris County Community Assistance office at 281-353-8424. Please beware of potential scams. In residential neighborhoods there is no charge by the county for debris removal. Note that the prime contractor for the county is a company named DRC, and they are paid through the county as well. DRC also has subcontractors, but again, they are paid through the county and DRC. While independent storm recovery companies are free to try and sell their respective services, you are under no obligation to buy from them and there is no charge for DRC or county debris removal. Anyone who claims otherwise should be promptly reported. Our local district office number is 281-257-4222. 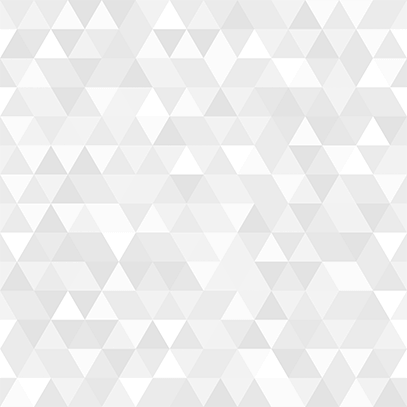 You may email me directly at Valoree.Swanson@House.Texas.Gov. Below in the yellow box are links to information you may find helpful in your particular case. It is an honor to serve you in District 150. We all deeply appreciate and thank you for your continued prayers and support. Please note that due to federal regulations in place since 1973, a permit to repair/rebuild from Harris County is needed if you flooded. Most are anticipated to be mailed quickly after talking to Harris County over the phone based on your address (281-353-8424 or the Debris Hotline at 713-274-3880). If you flooded and are within the 1% risk area, (commonly called the 100-year floodplain), an on-site inspection may be needed. Please share with your impacted neighbors and have them sign up for my email list for more complete information. 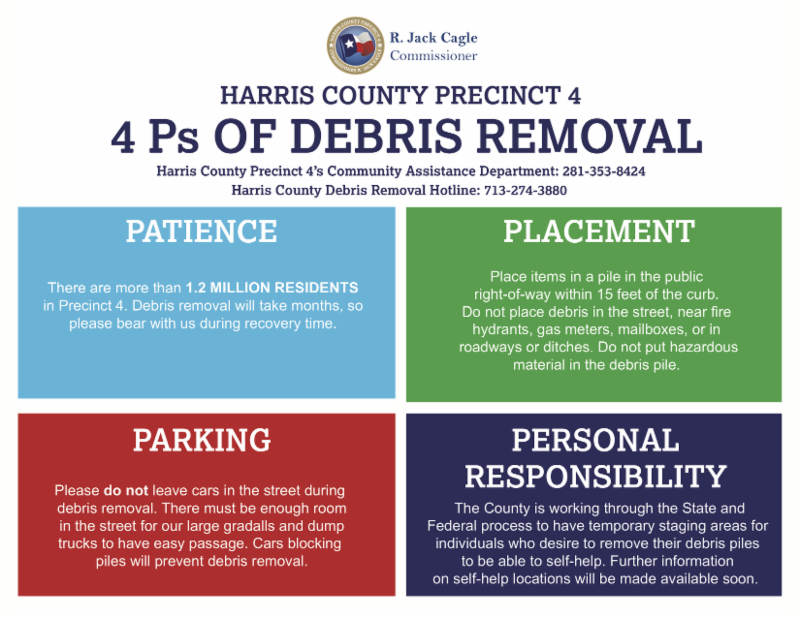 Harris County has issued several informative bulletins on this and on debris removal, that you can view by clicking the links below. Relating to the permitting, please note the fourth one in particular. 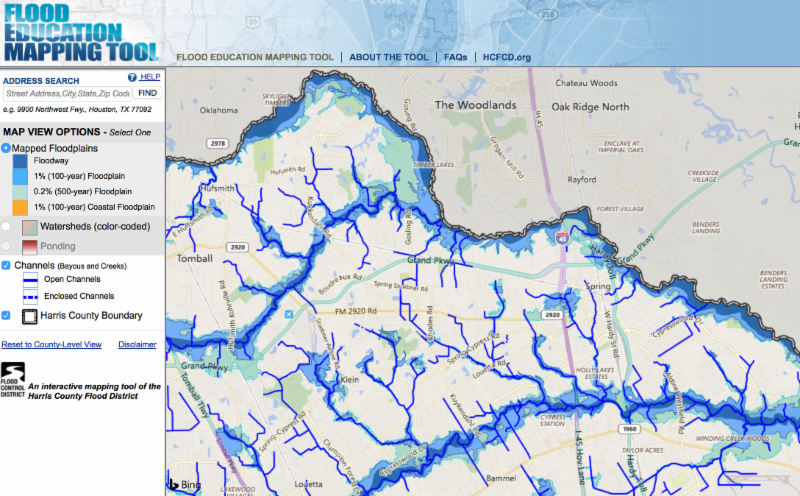 The above map can be accessed at http://www.harriscountyfemt.org. It allows checking particular addresses for whether or not they are in 1% or 0.2% flood chance regions (commonly referred to as 100 and 500 year flood plains). A few days ago, but don't forget our neighbors impacted by this natural disaster.